Although Jeep already released a few images, today it has unveiled full details and tons more photos of its redesigned Wrangler and Wrangler Unlimited. Making its official live debut at this year’s LA Auto Show, the new Wrangler, codenamed JL, is new from the ground up, though it’s immediately recognizable as the world’s most famous off-roader. While it retains many Wrangler and CJ hallmarks like the fold-down windshield, removable doors and soft and hard top roof options, the new Wrangler has gone on a serious diet thanks to extensive use of aluminum. The doors, hinges, fenders, hood and windshield are all made from aluminum. Under the hood, buyers can choose from three different engines: the familiar 3.6-liter Pentastar V6, 2.0-liter turbocharged four-cylinder, and a 3.0-liter EcoDiesel V6. An eight-speed automatic transmission is standard with the turbo four and diesel models, while the V6 also offers a six-speed manual. Power wise, the turbo four produces 270 hp and 295 lb-ft of torque and even has a mild electric system called eTorque which tacks on auto stop/start and engine shutoff during coasting and deceleration. The Pentastar V6 produces the same 285 hp and 260 lb-ft as before, while the diesel V6, already offered on the Grand Cherokee, makes 262 hp and 442 lb-ft. However, it won’t be available on the Wrangler until 2019. Two-door Wranglers will be offered in Sport, Sport S and Rubicon trims, while the four-door Unlimited features Sport, Sport S, Sahara and Rubicon trims. Of course, Rubicon is for the off-road enthusiasts and, appropriately so, comes with lots of exclusive equipment. This includes standard Tru-Lok locking differentials, a Rock-Trac 4x4 system, Dana 44 front and rear axles, 17-inch wheel with 33-inch tires, heavy gauge rock rails, electronic sway bar disconnect and optional steel bumpers with winch mount points and removable end caps. 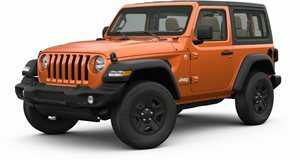 LED headlights and taillights are optional on the Rubicon and Sahara as are body color fender flares and body color hardtop roof. Jeep proudly notes its new Wrangler has an industry-leading approach angle of 44 degrees and a breakover angle of 27.8 degrees; a departure angle of 37 degrees and ground clearance of 10.9 inches. Oh, it can also drive through up to 30-inches of water and a maximum towing capacity of around 3,500 lbs. It has a standard 2.72:1 crawl ratio, and 84.2:1 and 77.2:1 for the Rubicon trim. The interior, as we’ve already seen, is of higher overall quality and refinement while retaining an overall rugged look. There’s now standard push-button start, 5.0-inch touchscreen and a 3.5-inch TFT gauge cluster display. Buyers can opt for the 7.0-inch or 8.4-inch UConnect systems, which come with Apple CarPlay and Android Auto. The TFT gauge cluster can also be upgraded to 7.0 inches. Safety systems include Blind-spot Monitoring and Rear Cross Path detection, a rear backup camera, and electronic stability control with electronic roll mitigation. 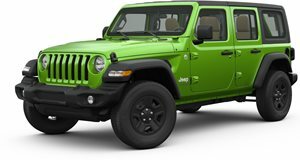 As always, the Jeep Wrangler will continue to be built in Toledo, Ohio. Pricing will be announced closer to when sales begin this January.